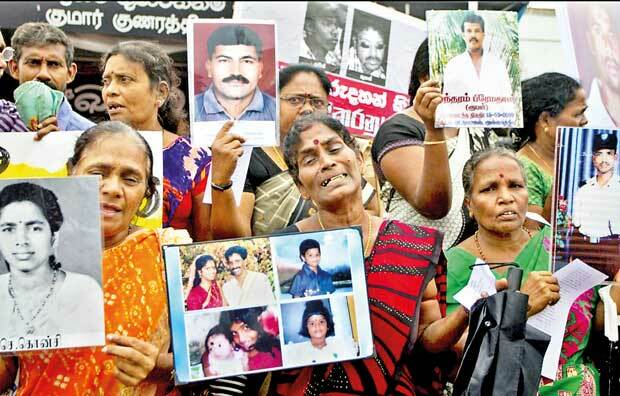 Media reports state that, at the suggestion of President Maithripala Sirisena, the parliamentary debate on the Bill to ratify the International Convention for the Protection of All Persons from Enforced Disappearances (CPAPED) will not held as scheduled on September 21. The media also quoted Prime Minister Ranil Wickremesinghe as saying that the “Disappearances Bill” pertains only to future cases and not those of the past (including disappearances which had occurred during the war). These two claims have pleased the Joint Opposition (JO) led by former President Mahinda Rajapakse and Sinhala nationalists outside the JO framework, because they imply that personnel of the tri-forces will be let off the hook. But the minority Tamils are extremely disappointed, if not livid. Of the two claims, the one made by the Prime Minister has hurt the Tamils a great deal. “The whole purpose of the Disappearances Act will be defeated if the past is left out of its ambit,” said Mano Ganeshan, Minister for National Co-existence, Dialogue and Official Languages and leader of the Tamil Progressive Alliance (TPA). “The very reason for the legislation is to inquire into the disappearances during the conflict, especially the last few years of the war. And most cases pertain to the Tamils,” he pointed out. “We condemn the reported move to postpone the debate on the Disappearances Bill and the Prime Minister’s interpretation of the Bill’s applicability,” said M.A.Sumanthiran MP and top leader of the Tamil National Alliance (TNA). “If the disappearance of the Tamils during the conflict and war can’t be inquired into, it means that the Tamils are not just second class citizens, but are fourth class citizens,” he asserted. Sumanthiran said that the Government had been dragging its feet on the introduction of the Disappearances Bill and making the Office of Missing Persons (OMP) operational because of a “lack of courage and political will” in the face of opposition from the Rajapakse group. “The reported decision not to hold a debate on the Disappearances Bill on Thursday (after having postponed it once earlier) only shows the Government’s pusillanimity,” the Tamil leader said. According to Sumanthiran, if the Government issued a notification making the OMP operational from September 15 and declared its intention to re-introduce the Disappearances Bill on September 21, it was because President Sirisena was going to be in the UN to address the General Assembly on September 19. Another reason was the recent speech made by the UN High Commissioner for Human Rights, Prince Zeid Ra’ad bin Hussein, castigating Sri Lanka for tardy and inadequate implementation of the resolution on accountability and reconciliation which it had co-sponsored at the UN Human Rights Council (UNHRC) in September 2015. According to Sumanthiran, the Sri Lankan Government hopes that making the OMP operational and fixing a date for a debate on the Disappearances Bill will silence critics in the UN at New York and Geneva at least during President Sirisena’s sojourn in New York. But unfortunately for the Government, JO leader G.L.Peiris let the cat out of the bag by claiming publicly, that the President had assured his group that the debate on the Disappearances Bill will not be held on September 21. Postponement isn’t going to go down well with the powers-that-be in the UN and the international community, Sumanthiran warned. Soon after the gazette making the OMP operational from September 15 was issued, the Center for Policy Alternatives (CPA) pointed out that it wasn’t constitutional, implying that it could be challenged in court. “On this ground, the OMP may be scuttled,” Sumanthiran warned. This definition gives the impression that the Convention and the Bill to follow, will be targeting the Sri Lankan Security Forces and not the LTTE which is a non-State entity. This is a major worry among millions of Sri Lankans who are grateful to the armed forces of ridding the country of the scourge of terrorism. But, as moderate Tamil leaders and even serving military commanders have said, enforced disappearances outside the framework of the law, can’t be permitted or condoned even if the perpetrator is a man in uniform. This basic principle is for the good of the forces and the people of Sri Lanka at large. “If the Convention becomes part of domestic law ,then there will be no reason for the UN High Commissioner for Human Rights to complain and go on to say that it may be necessary to use the principle of Universal Jurisdiction in Sri Lanka’s case,” Sumanthiran argued. The Tamil MP added that incidents of the kind which happened in Brazil against former Army Commander Gen.Jagath Jayasuriya (when he was threatened with arrest fo alleged war crimes) would not happen if Sri Lanka had a law banning enforced disappearances and trials were held. The Convention will be useful to all except those who had indulged in abductions which the world considers heinous. As regards the fear that the LTTE, which had abducted and executed countless Sri Lankans, including Tamils, will be allowed to go scot-free, Sumanthiran said that once the Convention is ratified, the spirit of a universal legal principle gets embedded in domestic law and cases against the LTTE can be filed and conducted. Sumanthiran said that the TNA isn’t against LTTE cadres being proceeded against for abduction, so long as the due process is followed in letter and spirit and the application of the law is even handed.